The countdown is on. The mere mention of May 25th evokes eye rolls, confusion, and (for some) cold panic as the clock ticks down and you try to work out what you will and won’t be able to do when your business switches to an opt-in consent regime. While there is no shortage of information about the regulations, and there’s very little practical advice on what is required from B2B marketers using consent as their basis to process data. This handbook walks you through what you can start doing to be ready for GDPR. Don’t hang around. 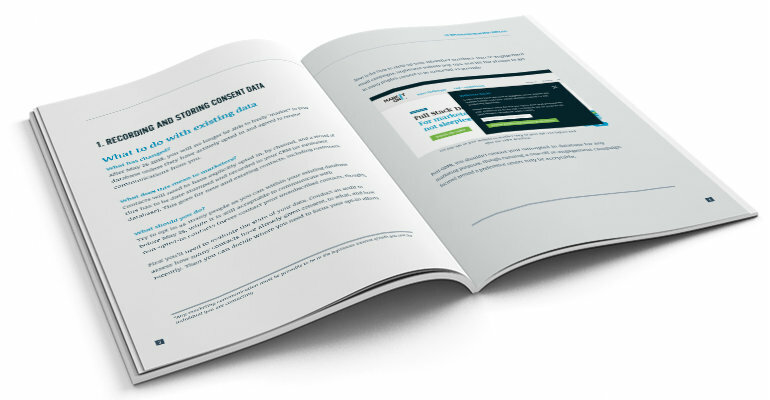 Download the guide and get your marketing practices into shape before GDPR hits. You’ll be glad you did when the deadline has passed and you wake up on May 26th! We released our GDPR action plan late last year but we realize that there is no one-size-fits-all solution when it comes to the new regulations. We’d be happy to put together a custom plan for you if it all still feels a bit overwhelming. MarketOne has nearly 20 years of experience with handling data in the European Union and we have recently partnered up with DQM GRC – a recognized leader in data governance, risk and compliance advisory services. And have we mentioned, we’re also ISO certified? In short, we take data and GDPR very seriously. So don’t delay! Get in touch and we can tell you more about the services we offer to help you comply with GDPR.